Love is an amazing experience for two Aries people. They are compatible in all ways you would think of. This should be a very interesting couple. 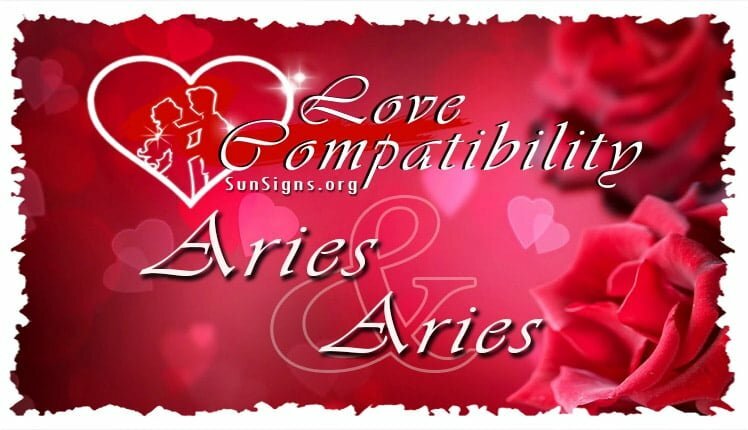 The Aries Aries love compatibility share enormous qualities. They both have the unending want of independence, meaning they will not have a problem comprehending their mate’s need for freedom. Love is life and passion is the food of the soul according to these two stars. The vigor will be more than evident and the level of destruction will be fatal in case of disagreement in an Aries and Aries friendship. When they are in love they love like its the last thing they would ever do. But they fall hard and deep. Aries Aries compatibility can be very successful when it comes to there living standards. The Aries as co-workers climb the corporate ladder so fast that there workmates are puzzled. This comes from there enthusiastic nature. Especially if they start a business together it will thrive and go to unimaginable heights. The only thing they need to check on is decision making. This is an issue due to their stubborn nature. In the Aries and Aries love compatibility both need to master the virtue of compromise in order to survive with each other. When an Aries is dating another Aries, the relationship is a fireball. They are full of energy and are very psyched up. They tend to engage in momentous sports or rather radical activities like bungee jumping. They leave a life of doing the impossible. The Aries traits shows that to them scary is a cup of tea. In this situations it gets tricky when one wants to do skydiving and the other wants to climb Mt Everest they never seem to agree. It is imperative for them to teach themselves how to agree because both have a quality of wanting to be the right partner. The passion in the Aries and Aries love compatibility is very intense making it a wonderful experience for both of them in terms of love making. Things are hot when it comes to the Aries and Aries in the bedroom or any other room, they will exchange their indoor activities if you understand what I mean. They will make love day and night and do it tomorrow because it always seems to be a new experience. The Aries Aries sexually always enjoy a time of passion after a fight as they are too occupied to resent each other. The Aries Aries soulmates share the same feelings most of the time in terms of high energy and exhaustion. For them these elements strike at the same time. They are either spirited and ready to go or totally worn out and cannot move. The main advantage here is that no one is ever forced to go anywhere whether it’s a dinner, a game or a get together that they do not want to go to. This means that the two never tolerate each other but rather enjoy each other’s company. It is always a contest of who gets away with what. Submission is never an option for the Aries and Aries in love. They always seek to be the best at everything. Understanding one another is the key for such a relationship to thrive. The interesting element of the Aries star sign is there power of going for what they want once they lay eyes on it. They see it, they want it, they get it! In the Aries and Aries compatibility, they never think about it or dwell to much on the details of what happens later. They move towards their prey like hungry lionesses. So they do not take time to get serious in a relationship. They dive right in to the sweet waters of love.This is where the men get lucky! Both the Aries men and Aries women have this impulsive drive in them that makes a relationship with them incredibly fun and intense. They live to prove themselves to the world and uphold the motto that anything is possible and that life is there’s to live. They do things unpredictably and this brings with it a certain excitement. It is crazy! For lack of any other words, this quality is unheard of in other signs and should be appreciated greatly. It never gets boring for them. They are never stuck in a rut. There is a big possibility in the Aries Aries relationship, to be extremely clingy making one spouse look needy which might not be a plus for the relationship. The two are possessive not forgetting that they are also hopeless flirts. The main problem here is the drive to challenge each other becoming arch rivals. Both the Rams yearn to experience victory and have a need to be right in everything. The endless search for this satisfaction puts the relationship at stake. It could cost the relationship a lot if not contained. In this couple Aries Aries love compatibility, the coupe should seek help to remedy the problem of competition so as to be good company to one another. It is difficult for couples of the Aries zodiac sign to be selfless. They also have a streak of openhandedness; they want to be the ones giving. In this situation they should learn to receive from each other. Arians are very candid and rarely have episodes of lack of clarity. Communication is not an issue between this two so no hard feelings stay in the dark. The couple may suffer a lot of drama due to their quick and ill thought decisions. War is common than not in most Aries-Aries marriages. Battles are inevitable making it important for them to decide to fight for something together instead of fighting against each other. If they decide to be together against the world then a lot of success can be achieved. There is a need to come together or agree to disagree. Spoiler alert! Aries have very bad mood swings. Today they think they have taken over the world and everything is possible then tomorrow they are sad because they think the world is taking a toll on them like the sky is falling down. These mood swings can put the Aries and Aries love compatibility at risk of a breakup. The mood swings do not happen to them at the same time so one can be in high spirits and optimistic about life while the other is sad and pessimistic. These two should work on a plan to take care of there feelings and control their emotions for the benefit of the relationship. If you fall in love with Aries just like yourself, you are a lucky person. You will enjoy noticing the similarities you and your spouse have in terms of behavior and discernment. Do not feel uneasy or in a rush to show them how interesting you are. This will all come naturally because this couple under the the Aries and Aries compatibility are meant for each other. Be yourself and do not try to apply any rules you read from a book. All you need to do is follow the Aries Aries love compatibility tips that are here and you will enjoy an enduring relationship. Keep in mind that the most important thing is knowing each other. You are now in the know, so go ahead and thrive together.